Sure Men Quantum Dry anti-perspirant deodorant roll-on 50ml is made to provide 48 hour protection against sweat and odour, so you can feel fresh, dry and protected all day long. This anti-perspirant deodorant has an invigorating and energising scent with fresh citrus, spices and wood tones, giving you the confidence to keep moving all day long, whilst feeling fresh and dry. It also contains Sure’s innovative Motionsense technology. It works like this: unique microcapsules sit on the surface of your skin. When you move, friction breaks those microcapsules and they release more fragrance. So every time you move, Motionsense keeps you fresh and free from odour. 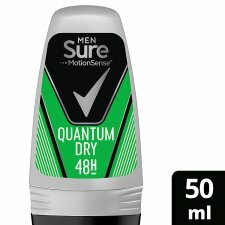 Whether you’re working hard in the office, playing hard out and about or just meeting up with friends, Sure Men Quantum Dry will give you all the back-up you need. Sure. It won't let you down. Each step, stride and sprint comes with an energising boost. 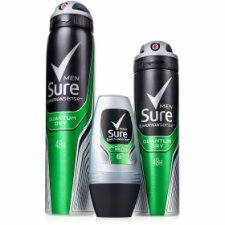 And with protection for up to 48 hours, sweat and odour won’t stand in your way. You can keep going to where you want to be, and that bit farther. Feel fresh. Feel energised. Feel ready for anything. Sure. It won’t let you down. How to use: Before applying, ensure underarms are dry. Roll on in circular motions, checking coverage is even on both underarms. Avoid contact with eyes and broken skin.